TrigpointingUK • View topic - Sharp Haw trig at risk? Sharp Haw trig at risk? 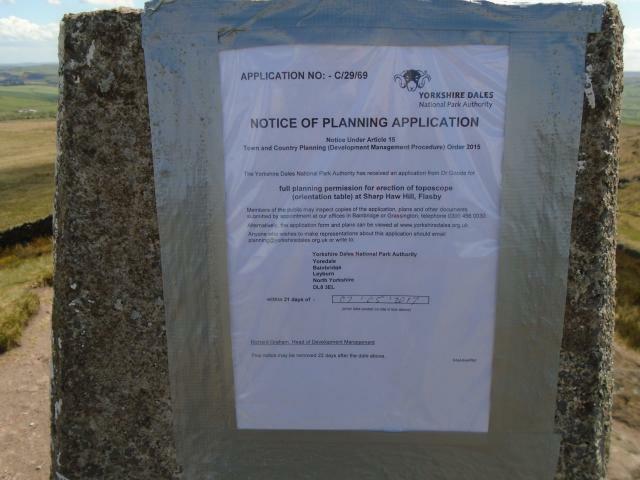 Do you have any more info for the planning permission at Sharp Haw http://trigpointing.uk/trig/5916, please? Is it too late to object to the planning authorities? Oddly, Brown Clee and Sharp Haw are probably my two most-visited trigs, would guess 20+ visits for each. Re: Sharp Haw trig at risk? Do you have a note the Planning Application reference number, and which Local Authority this is? It is possible we could find out more details about what is planned online. Hopefully the plan is to build a toposcope separate from the trig pillar and that the notice has been fixed to the pillar because there is nothing else to post a notification on up there. allows the reference number to be entered and details obtained. - I'll email them to ask if the trig will be affected. We don't want another Brown Clee mafia episode! Hello again yet again i think another trig is possibly on the way out there's not much room up there for two monuments.Could be another topograph coming soon but why don't they re position the trig somewhere else so it is not lost forever.The other night i had a bit of spare time and painted the trig on weets hill near Barnoldswick was surprised how many local people with children came to visit touch and sit on the trig.It dawned on me that night how many people really like the trigs and would miss them if they were gone after all they've been there 80 years in some cases. i think another trig is possibly on the way out there's not much room up there for two monuments. I'm slightly more hopeful for this one. The planning document says 4.3 metres from the trig, at a bearing of 330 \degrees. see anything like this mentioned although if others would care to double-check that would help. I have had a quick look at this application and agree with Ted. This looks like the trig pillar is safe as it is. 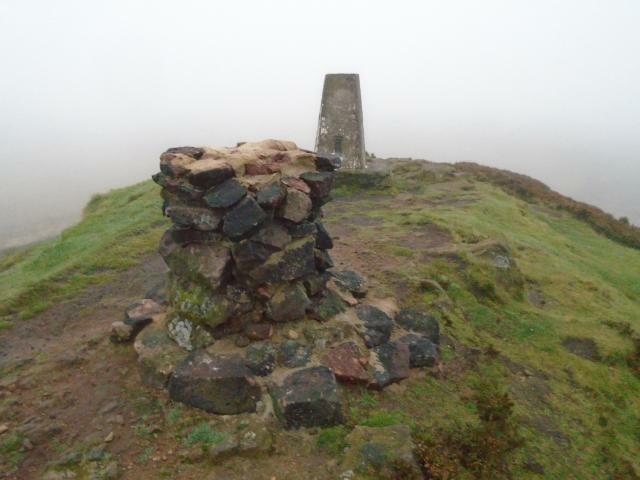 The new structure is proposed to stand "4.3m at 330° from trig point". When one of my local pillars was joined by a new toposcope around 20 years ago, the O.S. column was treated to a fresh coat of paint before the dignitaries arrived for the unveiling ceremony of the new structure. For the record: Pillar completed 25th May 1949 costing £23.7s.11d. Computed as tertiary triangulation station SD96/T40 during 1951. Levelled for height also in 1951. Last maintained by the OS in May 1976. Dear Mr Allwood, the proposal would be about 5 metres from the Ordnance Survey triangulation pillar and nothing is proposed to it. I generally work remotely so if you need to contact me, email is the best way and I can ring you if necessary. Glad to hear the trig at sharp haw is safe and will not be destroyed after all,Ted and Grahame you have gone out of your way to find out about this every credit to you both.Hope to meet some of the fellow Trig Pointers someday on my travels have only ever met two and then only fleetingly would like to catch one in the act of photographing one and taking a grid reference. I don't think I can find words to describe it How did they get planning permission from the National Park for this. At least the trig is still there.